A common question from clients in professional services, legal or consulting firms, which usually operate a strict time-writing regime, is “How do we Timewrite KM”? Approaches seem to vary, with some companies allowing neither billing to clients nor a separate timecode, therefore relegating KM to a “personal time” activity. Personally, I think KM should be billed to clients. Knowledge Management should only be introduced if it is going to benefit clients, and indeed the whole purpose of Knowledge Management within a professional services firm is to “bring the whole knowledge of the firm to bear on each client’s problems”. Therefore KM is part of providing a better service (in fact you could see KM as a component of good business practice), and should be paid for by the client. Therefore the time spent in Peer Assists, After Action reviews and even Retrospects should be billed to the client, by the logic of “we provide a better service to you through KM, so KM is billed as part of that better service”. (Of course, by the same logic, if KM is not delivering a better service, then you should stop doing KM). Timewriting in this way keeps the focus on KM as a means to support the clients. Giving KM a separate timewriting code implies that KM is an add-on, and an overhead, which is why I don’t like this approach. KM should be seen as an investment, both for the client and for the firm, and not as an overhead cost. However I can see there may be some logic in having a separate code for Retrospects which do not benefit the current client, but which benefit clients in future. You could arge that because the results of the Retrospect are not shared with the client, you cannot charge the activity to the client, and therefore bring in a separate code as part of overheads. However most firms try to keep overheads down, which disincentivises taking time for learning. Not allowing people to timewrite KM at all will kill KM, unless you can find a sneaky way around the system. Last week I was discussing just such a sneaky way, with a KMer from a company with no KM charge code, and where nobody would spend any time on Retrospects or Lessons Learned. However one thing they do, on every client project, is to assign a junior as part of the juniors’ Development Activity. Here they have the opportunity for KM by Stealth – to use the Junior as the corporate learning resource. The junior can keep a “learning blog” or “lessons blog” on which they can identify and publish all lessons and good practices recognised on that project. This is analogous to the “commanders blogs” used in the Army, which prove an excellent source of learning. The blog allows the junior to reflect and learn, and through that public reflection allows the firm to learn as well. The community of learners can take a role similar to the “lessons learned integrators” but without the supporting lessons learned system. However you charge KM – to the client, to a separate code or as part of Development Activity – you need to find a way to make it possible, otherwise your organisation will fail to learn, and thereby learn to fail. 4) This team, with the backing of the Head of Projects, takes accountability for the delivery of effective “learning from experience” within the project context. They monitor delivery of learning against the company expectations, they facilitate the lessons identification, and they operate the lessons management process, they drive re-use. In both these cases, KM is given a job to do (“Improve or protect functional capability though CoPs and CoP knowledge bases”, “Improve company performance through project learning”), has individuals accountable for that job, and has a reporting chain. 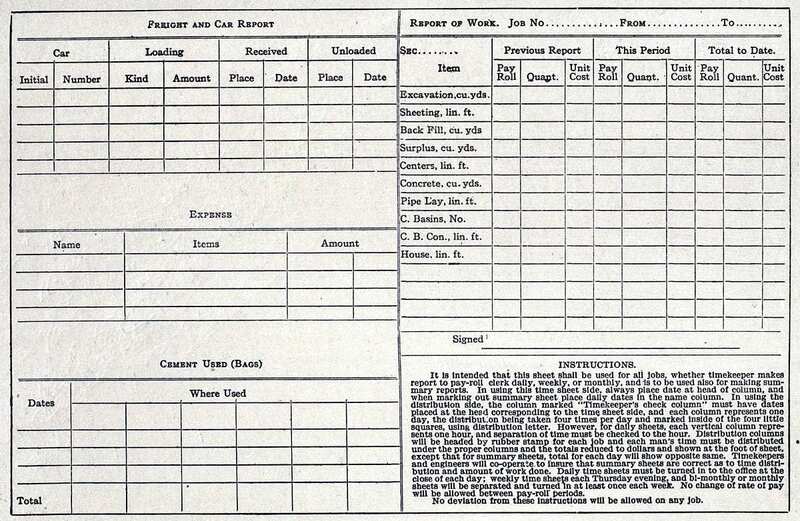 The job is clear, performance is tracked. That’s how you really embed something for the long term. 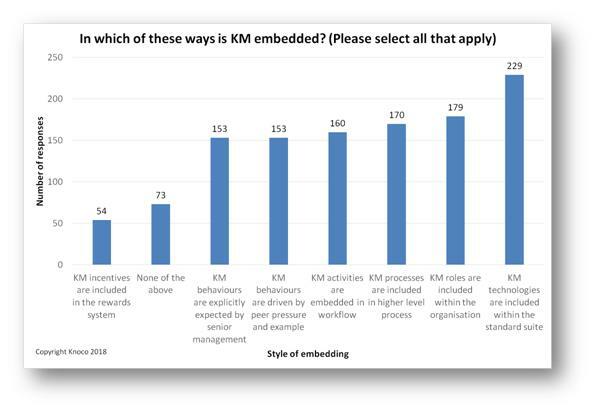 What does embedded KM look like? 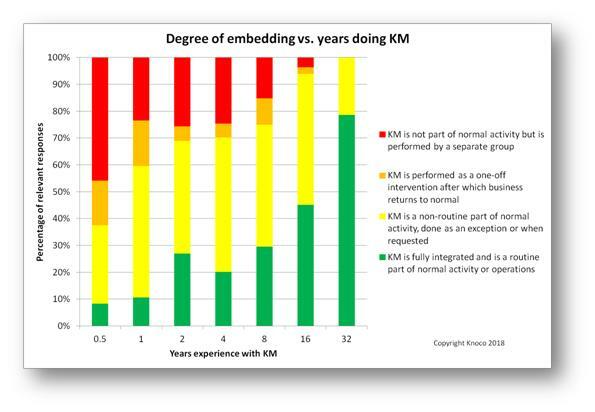 Embedded KM is as normal as any other embedded work practise, such as budgeting or time writing. People often ask “what does embedded KM look like? The answer is that it looks like any other embedded management discipline. It’s a work habit – something you dont think twice about. Just in the way that “doing your budget” is fully embedded into the project cycle, do “doing your km plan” can be embedded into the work cycle. Just like “completing your timesheet” is seen s a required step within financial management, so is “doing your lessons capture” seen as a required ad embedded step. Budgets ad timesheets are just “things we do as part of the job”, and one day you will find the processes of KM becomes equally embedded. Just like budgets and timesheets, when KM is fully embedded we will do the KM processes naturally and without argument. We will know the processes are expected, we understand their point, everyone else is doing them, and if we don’t do them, people will be taken aback. It’s just a part of the way we work, and the things we do. You can start, by identifying where, within the business process, there is the greatest need for the team to acquire knowledge, and adding a “Knowledge Acquisition” step, such as Peer Assist, Lessons Review, Knowledge Site Visit, Collaborative work session, or a Knowledge Management Plan. There may be several such steps needed within the business process. You can look at where, within the business process, there is the greatest need for the team to create new knowledge, and add a “Knowledge Creation” step, such as Deep Dive, Think Tank, or Business Driven Action Learning. Then you can look at where, within the business process, there is the greatest need for the team to discuss and identify learning. These will be steps which follow points where the greatest knowledge has been created, or the greatest learning acquired, and where you need to add a “Knowledge Capture” step. Some of these will capture knowledge for re-use by the same team, and may include small scale After Action Reviews. Some will capture knowledge and lessons for other teams, and may include Retrospect. Some may include hand-over of knowledge to later stages in the project or product life-cycle, and may include Baton Passing or Knowledge handover. There may be several such steps needed within the business process. That is your starting point – looking at the flow of knowledge into and out of the process. You may eventually add other steps where needed. Here is a nice graph from our global KM surveys that shows how KM maturity progresses. 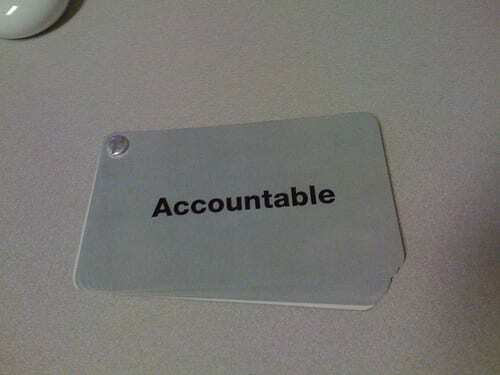 Which of the following best describes the current status of KM within this organisation (or part of the organisation)? To what extent is KM now integrated with the normal work of the organisation? Choose the sentence that most closely fits your answer. 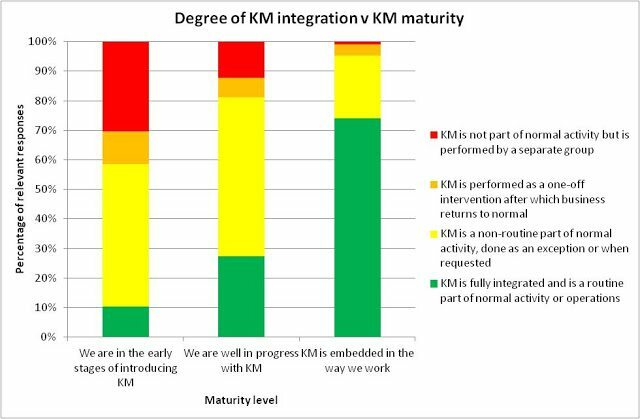 The graph shows how the responses to the second question vary according to the first question, and shows how the integration of KM changes with maturity. In the early stages of KM, KM is mostly either performed by a separate group (30% of responses) or as an exception to normal process (48% of responses). For organisations which are well in progress, the role of the separate group is much reduced (to 12% of responses), as is the one-off intervention. The largest proportion of responses is still that KM is an exception to normal process (54% of responses), but the second largest is that KM is fully integrated in normal activity. 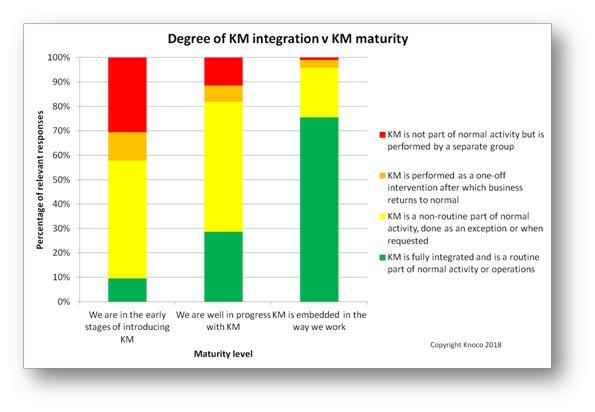 For organisations who claim that KM is fully embedded, almost three quarters say that KM is fully integrated in normal activity. 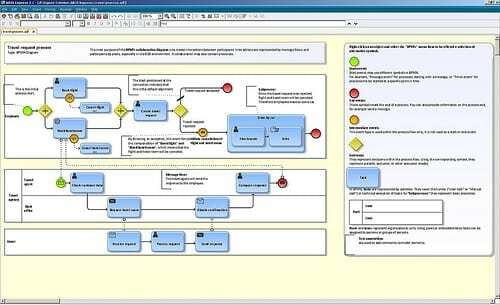 As you might expect, there is a close link between fully embedded KM, and full integration of KM activities into operations.